The algorithm I'll be using to generate a voronoi diagram will be the Fortune Sweep algorithm. This maintains both a sweep line and a beach line, which both move through the plane as the algorithm progresses. The sweep line is a straight horizontal line moving from top to bottom down the plane. At any time during the algorithm, the input points above the sweep line will have been incorporated into the voronoi diagram, while the points below the sweep line will not have been considered yet. The beach line is not a straight line, but a complicated, piecewise curve above the sweep line, composed of pieces of parabolas; it divides the portion of the plane within which the Voronoi diagram can be known, regardless of what other points might be below of the sweep line, from the rest of the plane. For each point above the sweep line, one can define a parabola of points equidistant from that point and from the sweep line; the beach line is the boundary of the union of these parabolas. As the sweep line progresses, the vertices of the beach line, at which two parabolas cross, trace out the edges of the Voronoi diagram. The beach line progresses by keeping each parabola base exactly half way between the points initially swept over with the sweep line, and the new position of the sweep line. Mathematically, this means each parabola is formed by using the sweep line as the directrix and the input point as the focus. The site event is the addition of another parabola to the beach line (when the sweep line crosses another input point). 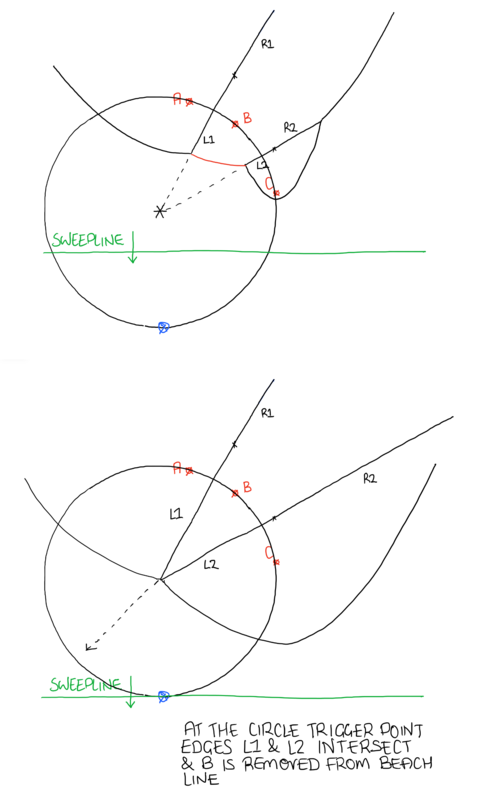 The circle event is the removal of a curve from the beach line (when the sweep line becomes tangent to a circle through some three input points whose parabolas form consecutive segments of the beach line). 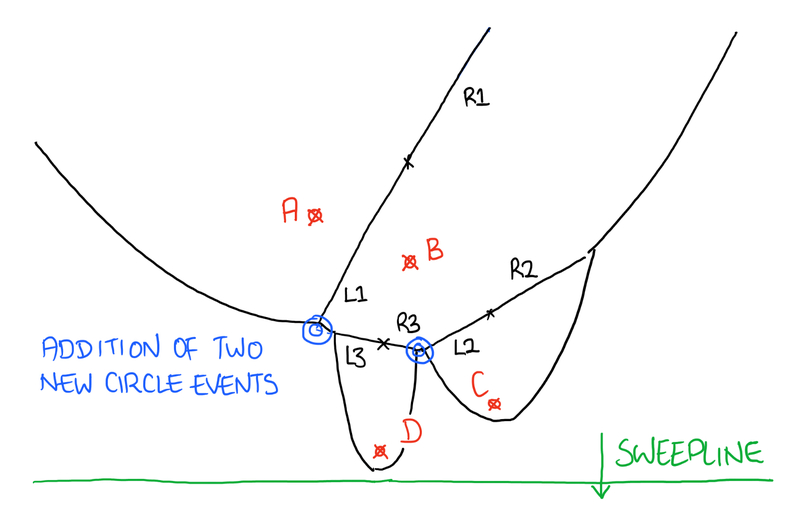 Each such event may be prioritised by the y-coordinate of the sweep line at the point the event occurs. The algorithm itself then consists of repeatedly removing the next event from the priority queue, finding the changes the event causes in the beach line, and updating the data structures. We add to the beach line when the sweep line hits a new point. For this we need to find out within the beach line which parabola the input point is under. We store a reference to the parabola we found in the step above. Next, we create two edges. One either side of the new node we’re inserting. Whilst we create two edges they appear as one, each sharing the same starting point but pointing in opposite directions. With the two new edges we can rebuild the beach line. We first duplicate the parabola node we found in the first step. We then take the two edges and rebuild the beach line as per the diagram below. As we can see in the diagram above we have now changed the structure of the beach line, we have inserted a couple of new edges. Because of this we need to remove any circle events from the parabolas/nodes either side of the parabola found in step one. We also need to remove these from the event queue. Finally we need to check for two new circle events, we only need to check what has changed, in this case we need to check the original parabola, and also the copy that was made of this parabola. 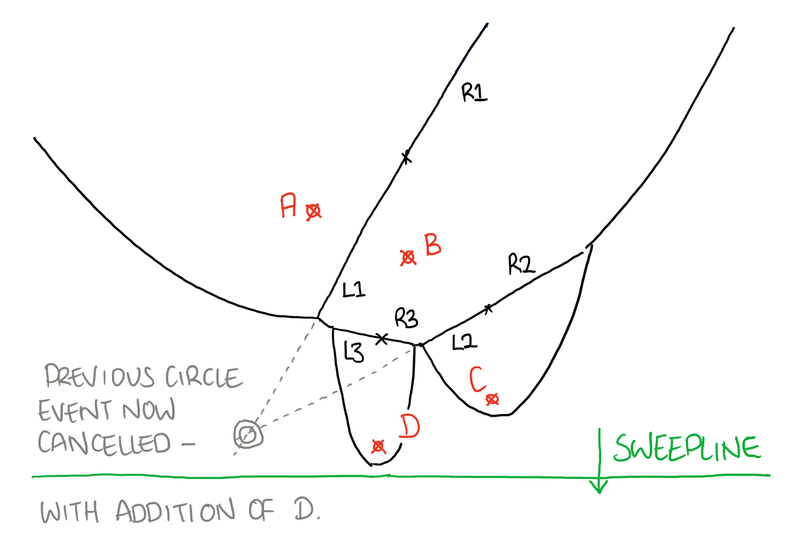 Only occurs during a circle event, when we need to remove two edges and a parabola from the beach line. First things first we take the parabola node, and it’s adjacent neighbours (the edges) and close these off at the intersection point. This is as simple as finding the intersection point and assigning their end point to this intersection point. With both of these edges gaining an end point we can add these to the final edges array which will be drawn to the screen. Next we construct a new edge from the neighbours edges, the left neighbour of the left edge and the right neighbour of the right edge. Once this is done we simply remove the parabola node and it’s adjacent edges from the beach line and insert the new edge in their place. First we need to calculate a starting point for these two edges, they share the same starting point and point in opposite directions. For the starting point of these edges we know the x coordinate, it’s just the x coordinate of the input point. We just need to calculate the y coordinate, this is where a ray pointing vertically upwards intersects with the parabola. See find y coordinate of input point where it intersects with a parabola above it. Next we calculate the Direction. This is done as follows. Then we calculate the gradient, m. If we draw a line between the generating points the edge would be perpendicular to this line, every point on this edge is equidistant between the left point and the right point. Finally we can calculate the crossing point with the y axis, C. We use the equation of a line here (y = mx + c) and place in the values for the gradient, and the starting x and y coordinate to get C.
This is just a case of checking to see if the node passed into the function has a circle event associated with it. If it does we remove it, by setting it to null and we also then check through the event queue and remove it from there. For this we just pass through each element in the queue, if it matches with the one we’re testing we remove it from the queue and stop searching. To get y simply input the x value of the input point into the equation above. The beach line is stored as a reference to the first node in the linked list. The general structure of the beach line is a parabola, edge, parabola, edge, then parabola, and so on and so on. I search through each pair of parabolas and edges and work out where the edge intersects the parabola. If the x value of the new point is less than the parabola/edge intersection x value then we know that the new point is under this parabola. If it isn’t we just keep testing each pair of parabola and edges until we find a match. First I need to get the equation of the current parabola with respect to the current sweepline.y value. Finds the equation of the parabola in a similar way to the method described in find y coordinate of input point where it intersects with a parabola above it. First we need to get references to both the left and right edges for the current node (parabola). With these we find out if these edges intersect with each other. We now now know if the two edges will intersect at some point in the future. If they will we need to add a circle event to the event queue. For this we need to add a trigger point, this will be triggered when the sweep line hits the bottom of the circle. Notice I said ‘potential’ trigger point, this is because the trigger point may have already been passed by the sweepline. If this is the case we simply ignore it. If the trigger point hasn’t been passed only then can we create a circle event with the trigger point. We can find the intersection between two lines quite easily, firstly we just check to make sure they are not parallel. We can do this by ensuring the gradient for each edge are not equal to each other. We now have a potential crossing point (x , y). Bear in mind we’re not dealing with lines, we’re dealing with rays, they have a start point and a direction. We need to make sure the intersection point is not on the other side of the ray. 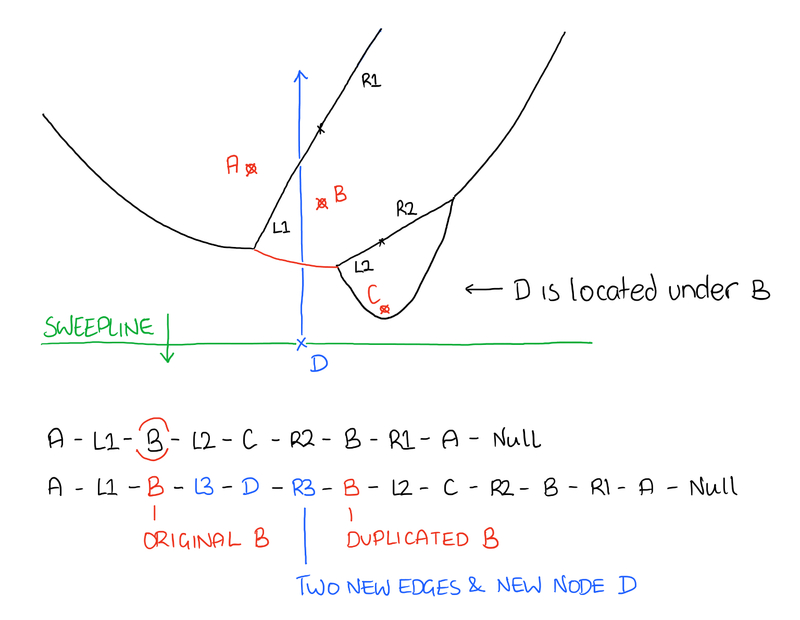 If all these tests pass we have an edge - edge intersection at point (x, y). We know the starting point of this new edge, we calculated this when we worked out the end points of the two edges which triggered this circle event. For more on Fortune's algorithm check out the Wikipedia page, bear in mind their version travels from left to right across the plane. I've produced a couple of videos of the diagrams being generated, these are on my YouTube channel here and here.